Reach your Audience with utmost Precision. 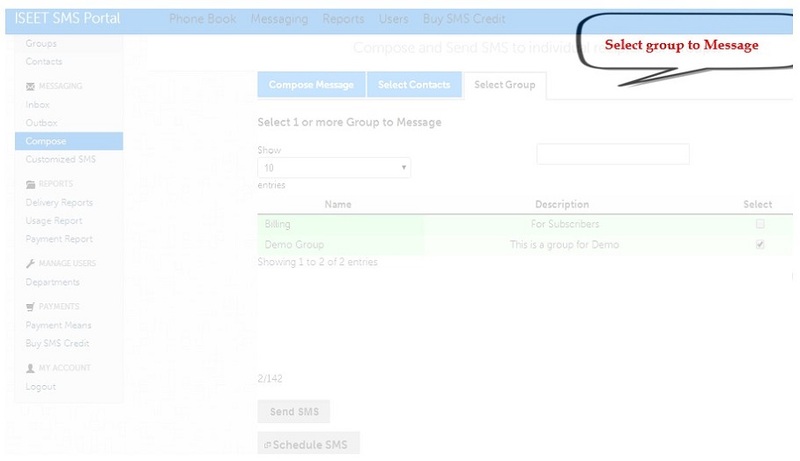 All the System menu items are in a single place allowing you to perform all your SMS communications. 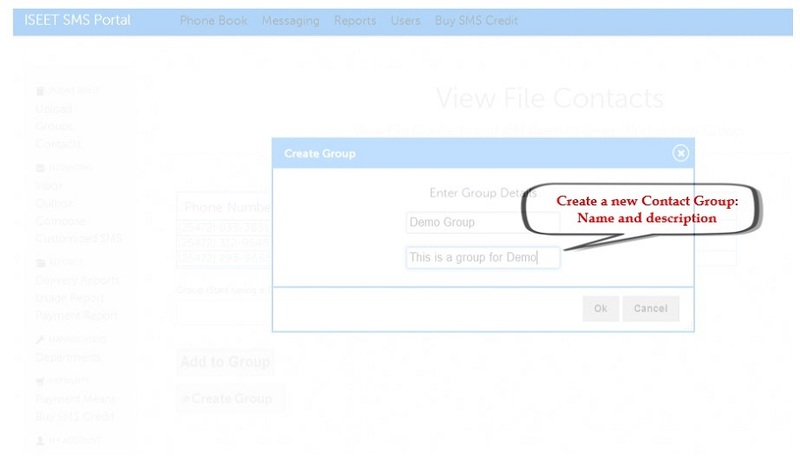 Compose and send SMS to Groups and Individual Contacts with Custom Header. 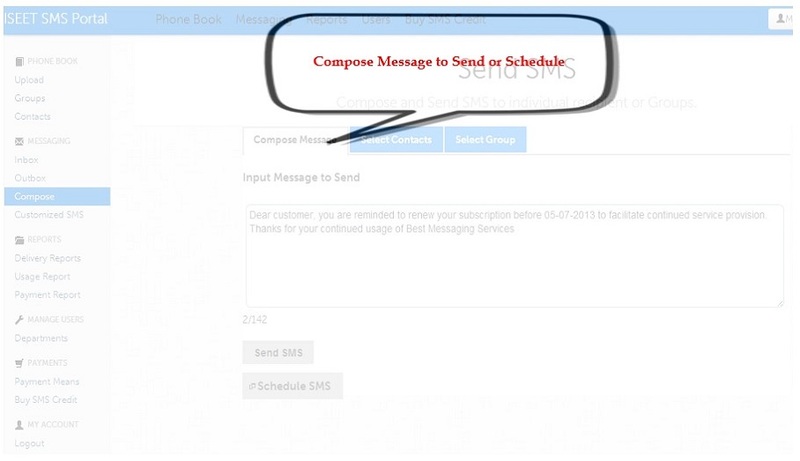 You can compose and schedule Messages to be sent later by the system (Well planned communication). 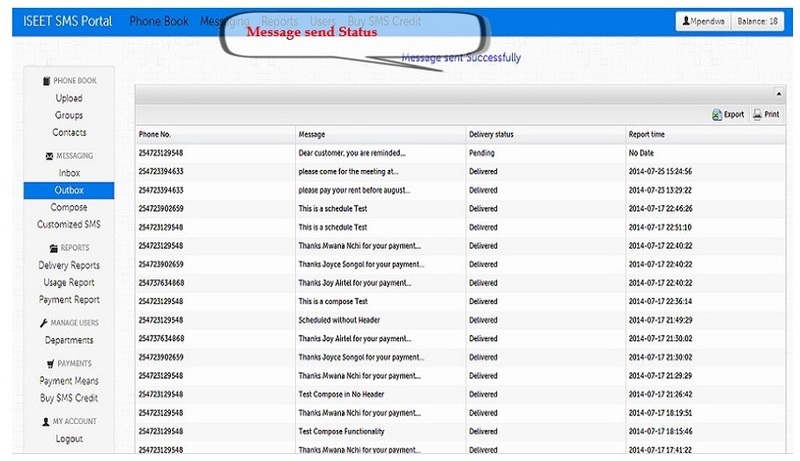 A Summary report of your system Usage together with a report of the delivery of your sent Messages. 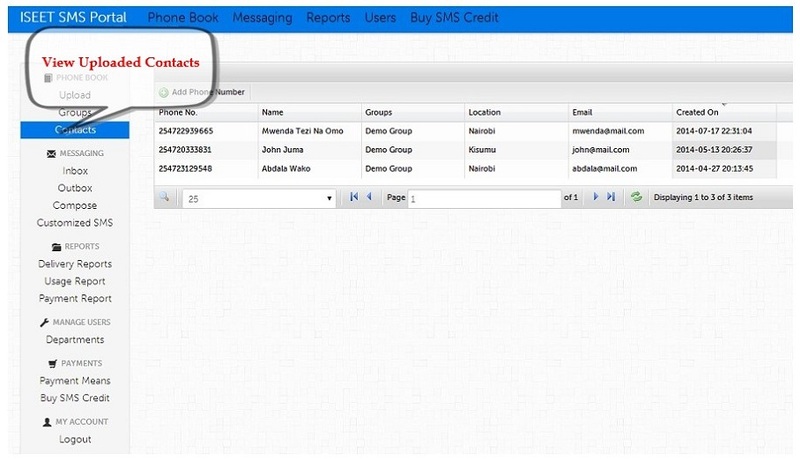 The main Admin can create Departments or Branches, allocate them credits and keep a Track of each user's usage. 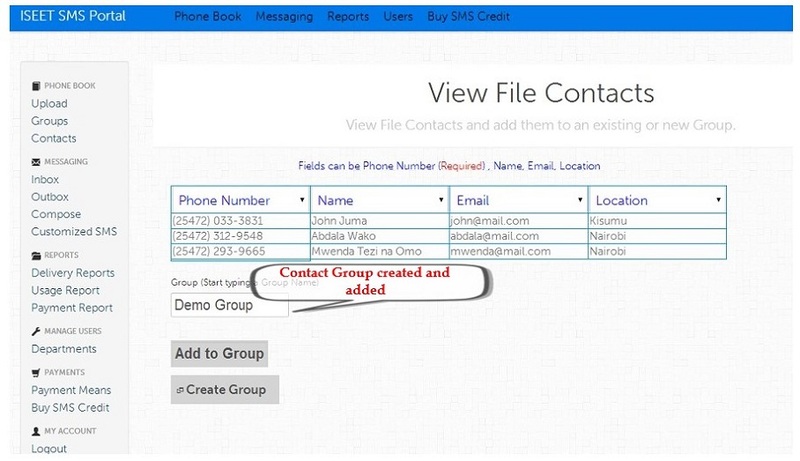 Create and edit Contact groups made up of related contacts. Messaging to a contact group ensures you control who get which message. With a wide range of Payment Option, buying SMS credit or effecting any other payment can be conveniently done. Every penny counts; That's why we've taken the effort to give you a report of every single cent you spend reaching your target Audience. We provide you a report of the delivered SMS, pending and failed SMS to ensure you have a good evaluation of your SMS campaign. The reports are available on daily, weekly, monthly, annual and Combined basis giving you a view of the trend of your SMS campaigns. With easy to analyse graph representation Best Messaging gives you a quick way of performing any analysis. We provide you a stand by support on all issues that you might encounter. It all starts with a user training to ensure you get the best that Best Messaging has to offer. 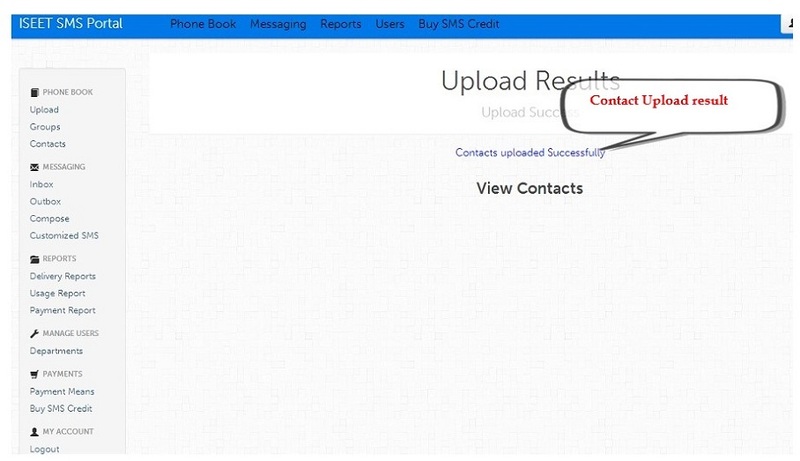 Continuous system support is available through our contacts provided in the contacts section. Because the smooth running of your business is important to us as it is to you we deliver you quality support just to ensure you attain the best of productivity. We are happy to have happy clients and that makes our relationship with you a great one. Imagine a case where you have thousands of phone numbers to SMS and you'd like to SMS every one of them in a way that addresses them on an individual level. Addressing each of them by their name or include a mention of their branch or even a period of Time in the Message. 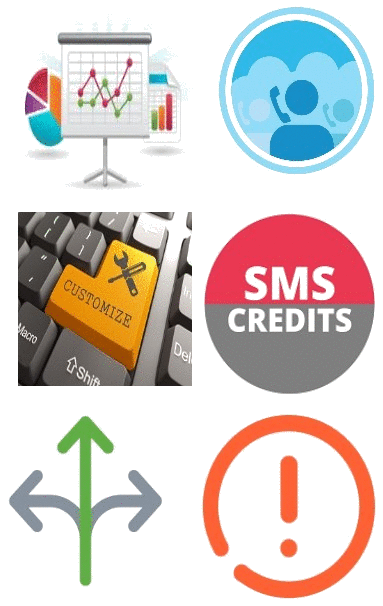 Well Customized SMS is all you need. It's is a cool feature that allows you to address each individual contact with their name; include in the text message their location, Amount, period of time. The fields can be adopted to anything of your choice thereby providing the flexibility we promised. The end recipients receive the message as though you took time to compose an individual SMS for every one of them. If you were to run out of SMS credit while on the hand you have an urgent message to send to your recipient. Writing a check to top up your credit balance is the last thing you'd like to go through as its gonna work against the urgency of the matter. That's why we've provided you with instant ways of topping up your credit. With all Mobile Money Payment available you can conveniently top up your Balance right from your MMobile Phone. If you enjoy the comfort of using credit cards, the freedom is your as well. It's good to know that your SMS balance is instantly updated on completion of payment. For a case where you have a contact file with thousands of contacts, it becomes near impossible to go through every single contact to counter check if its a valid Phone Number. Best Messaging check every single contact in the contact file to ensure its a valid phone number before its posted to your contacts. This is crucial for accounting purpose as you wouldn't like to spend time trying to message invalid phone numbers. It also ensures a high delivery rate and economical usage of your credit balance. Many are the times you find that you have set of contacts in different file formats. Because we believe working on file formats is not the kind of thing that you should be doing we have done the work of ensuring that upload of your contact files is seamless. 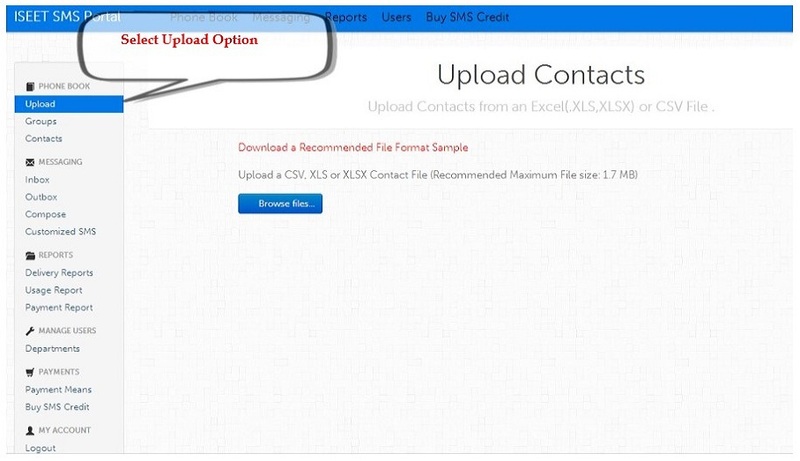 Best Messaging allows you to upload contacts in the near ubiquitous CSV, XLS and XLSX formats. At any point that the need for exporting reports might arise, Best Messaging gives you a ready option of exporting just by clicking export option. When you have to print a set of report, the story is the same, just click on it. 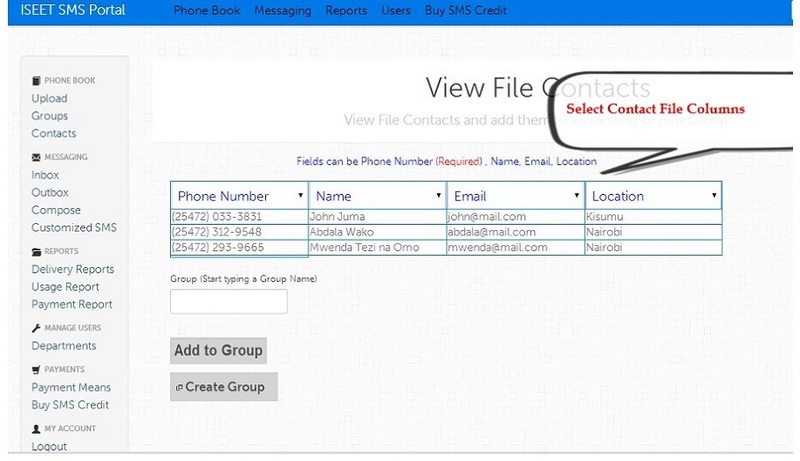 When you have to upload contact files, you have the freedom of having the numbers with or without the 0 prefix, with or without the country code prefix, yours is just to upload not formatting numbers. 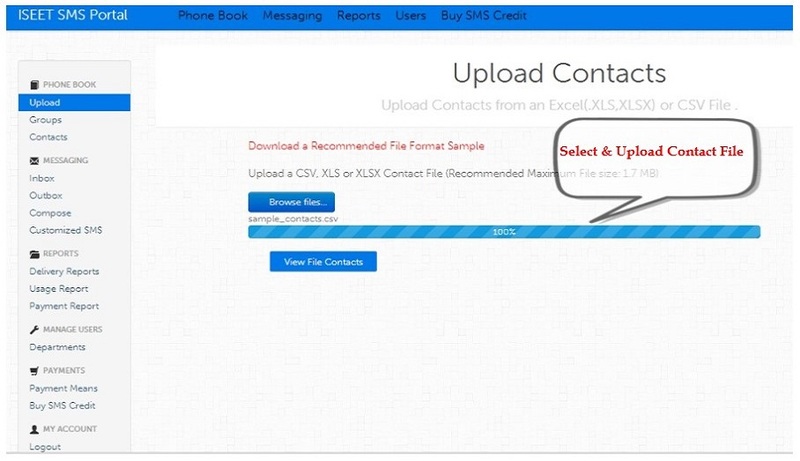 With the option of specifying the Contact file Column details, you are able to select your desired user details to be uploaded. Control is entirely yours and there is room for choice in your hand.